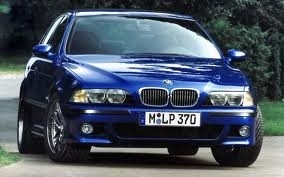 The new M5 was introduced at Geneva Motor Show in 1998 and was produced in 1999 at BMW Factory in Dingolfing Germany. The new model was produced in 3 different versions European LHD , RHD and the North American Version. New M62 V8 Engine that produces 294 kW (394 Bhp) . This new engine is the first BMW engine with variable valve timing called “Vanos” . The new BMW M5 uses Getrag Type D manual six speed gearbox. Servotronic vehicle speed sensitive power assist with two levels of resistance controlled by the Sport button mounted on the central console. The New E39 M5 uses four-wheel ventilated brake disc that measures 328mm in diameter in the rear and 345mm in diameter in front disc. Park Distance Control (parking sensors) placed on front and rear bumper. This rear bumper is made from high quality polypropylene , prepared for painting (primed) , and it is available in two versions , with Parking Distance Control (sensor holes) and for cars without PDC. The rear bumper is available in 2 versions : single muffler outlet and twin muffler outlet. Our bumpers are made of polypropylene, this material is a good replacement for fiber glass, which is not as much resistive as polypropylene. This material is more flexible, shock resistant and durable.